Here Comes When (8-1) finished with a rattle to emerge victorious in the vision.ae Challenge Stakes, initiating a double for Jockey Crowley. Last seen winning a Group Two in Germany in early September, Andrew Balding's four-year-old was an 8-1 shot and Crowley cut a confident figure in the saddle, settling him on the heels of the leaders towards the stands rail before getting to work inside the final quarter of a mile. Once it became clear the gap was not going to materialise, Crowley pulled wide to deliver his challenge and Here Comes When responded impressively to quicken to the lead, passing the post a length to the good over Cable Bay, with 7-2 joint-favourite Breton Rock third. 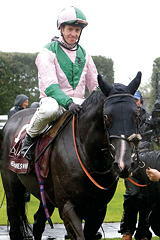 The jockey said: "He's a hold-up horse so I needed a bit of luck to get out, but I had the horse to do it. He seems to be improving and that was a good effort under a penalty. The ground is key to him."